Where does the time go? It’s hard to believe, but we are rapidly approaching the beginning of another summer season here at the museum – the beginning of our 10th year on July 3rd! We’ve been so busy here that we’ve hardly had time to take a breath. There has been our normal complement of excellent speakers during the off season; on November 27th, we had Roy Wilkins come in and speak to us about A-Cats. 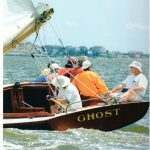 That is a subject near and dear to our hearts since we are now the proud owner of both the Ghost, donated to us by Bill Fortenbaugh, and the Raven, donated by Peter Stagaard, Cory Wingerter, Dave Aldian, and Mike Tufariello. Both boats have a very active summer planned with the local yacht clubs who will be putting them to good use. 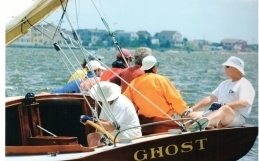 Educational programs will also be scheduled and conducted by sailing experts John and Gretchen Coyle. On December 18th., Christina Grossi, who was the lead counselor for last season’s New Logic Marine Science Camps that were based here at the museum, came and spoke to our audience about sharks. Unfortunately, we had to cancel January’s presentation due to bad weather, but we rescheduled it to February 12th and welcomed the popular “anchor lady” Carole Bradshaw back to the museum to talk about the wreck of the Fortuna. In a departure from our Friday night programs, on the afternoon of Saturday, March 12th we had Fred DeLise and his friends here to give us a lecture on metal detecting. He donated several items, including a section of sheathing and an interesting military dog tag found during his exploration of our beach in Holgate. 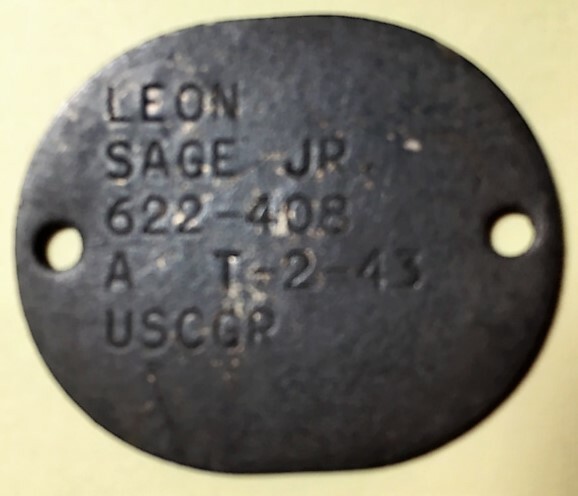 Hopefully, with the help of the public, we will someday be able to return this dog tag to its owner or his family; it is marked, “Leon Sage, Jr. 622-408 A T-2-43 USCGR”. Going back to Friday evening programs, on April 7th we had divers Joe Mazraani and Anthony Tedeschi here to introduce the new book, Where Divers Dare – The Hunt for the Last U-Boat, and to share with us their exciting discovery and research of the U-550. April 29th had John Fiorella in to detail the tragic story of the U.S.S. Indianapolis. All of these talks were given to completely packed audiences, and we regretfully have had to turn many away from attending. We are in discussions as to how we can increase our capacity and provide a venue large enough for all to attend; it’s not something we’ll be able to do quickly, but we are working on it! Another notable event we’ve had at the museum is the dedication of the Hank Garvin collection of shipwreck artifacts on April 23rd. Longtime diving legend Captain Hank, prior to his death on May 26th, 2015, had donated a portion of his collection to us. Subsequent to his passing, his son Lee and daughter Ilese donated the bulk of his remaining artifacts to the museum. The dedication of that collection and a memorial gathering were well attended. In addition to family members, notable attendees included diver/historian/author Gary Gentile, Cathie Cush, members of the Garloo crew and other longtime friends of this gentle giant. On May 7th., Captain Stephen Nagewicz will be at the museum for the release and signing of his new book Hidden History of Maritime New Jersey. This is probably the most comprehensive book ever written about New Jersey maritime history and we are honored to add this title to our lending library as well as to our gift shop inventory for sale to our visitors. Mail order copies are also available to those who wish to obtain this book. Finally, on May 14th from 2 to 4 pm, we will host a memorial service for our very dear friend and benefactor Virginia Leiss. Jinny passed away on April 10th at the age of 91. Our USLSS/USCG Room is dedicated to her and her late husband Ernest. Ernest, who passed away in 2002, was a Lt. Commander in the USCGR; Jinny enlisted in the WAVES in August, 1944, later specializing in Air Traffic Control, Dead Reckoning and Radar locating systems for night flight navigation. They are sadly missed by their daughters, Barbara and Gaillynne, and other family members, but live on in the memories of all who had the pleasure of knowing such fine people. As long as I’m talking about things that have been happening here at the museum, I’d better mention that the crew from the television program Mysteries at the Museum returned to film another episode. A few years ago, they filmed a short documentary on the fate of the Morro Castle; this time they focused on the circumstances surrounding the 1916 New Jersey Shark Attacks. 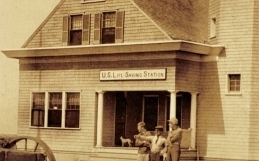 Since this is the 100th anniversary of these unprecedented attacks that inspired the popular movie, Jaws, it will most likely air sometime in July when these attacks occurred. Deb and I recently took a trip up to Mountainside, New Jersey, to pick up a collection of ship models from our dear friend Carol Hertweck. She and her late husband, Ted Lowy, had donated many models and other maritime relics to us several years ago, so we were very excited about this donation. We were not disappointed; there are some beautiful models in this group, which adorn the museum on both floors. Hopefully, visitors to the museum have noticed our new, brighter look. After many years of putting up with the low-budget window shades that we originally installed, we were finally in a position to get rid of them and have ultra violet protective film installed on all of our windows. Dan English, from Causeway Glass, gave us a nice price break, and did an outstanding job of installing this film on all 89 windows and doors. Nor only has it made an improvement in the appearance of the museum and is in conformance with professional museum standards, but it should improve the efficiency of our heating and air conditioning. We’ve got our summer programs in place and things will be pretty much the same as last year. On Friday’s we will have our children’s program again, starting with ALO offering various activities at 10 am. At 10:30 am, we will shift to our museum program which includes various fun, educational things to do, including our ever popular scavenger hunt. I had a bit of anxiety over this program since our popular volunteer, Sabrina, went off to college, but I’ve recently been in contact with her and she assures me that she will be back to run this for me. Needless to say, this elicited a very large sigh on relief! Following our museum activities, at 11:30 am, ReClam the Bay will be back to talk about man’s best friend, the clam? They will have an in-house talk, then proceed across the street to Morrison’s Marina where they will show and demonstrate their upweller, where baby clams are raised until big enough to be released into the bay. Also in store for this summer will be presentations by the Marine Mammal Stranding Center. Every Monday at 2 pm, from June 27th through August 15th, they will be here talking about various sea creatures along our coast, such as dolphins, seals, and turtles. No reservations are required for either the Friday children’s programs or the Marine Mammal Stranding Center talks, so come on out and attend. There are no fees for these programs, but donations are always appreciated. Once again this summer we will be hosting the very popular, and award winning Marine Science Camps which are taught by award-winning New Logic Educators. This has proven to be an extremely well attended activity and I have heard nothing but praise from all who have participated. In fact, my granddaughter, Hannah, thoroughly enjoyed the experience. For further information, and to make reservations, please go to www.marinesciencecamp.com. 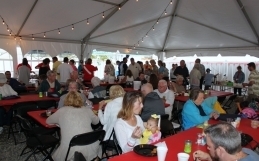 I’m sure that many of you have attended our annual fundraisers; this year’s event will take place September 10th, the Saturday after Labor Day. Each year our attendance grows, and we fine tune our preparations for the event. We’ve had rain for the last three years and have been working hard to keep everyone dry. This year, we have contracted for tent coverage that will cover the entire parking lot. No more scrambling to get everything underneath! Those who have attended have no doubt seen an increase in the number of guests. Last year we had approximately 460 attendees. We have set a limit of 500 on the number of tickets to ensure seating and comfort for everyone. I fully expect to hit that number this year, so don’t wait too long to get your tickets. Tickets are available at the museum and online. 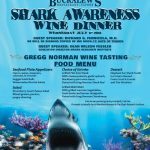 Each fundraiser has a theme, and this year’s event on September 10th will be The 1916 New Jersey Shark Attacks -100 Years Later. This should be a lot of fun, and Deb’s imagination is in high gear. She has already rented a mechanical white shark for the night, so come on out for a ride! In closing, I look forward to a very busy summer and hope to see you at the museum!